With Thanksgiving this week, we just couldn’t miss the chance to promote a great opportunity that Matt D. had last week at Fox Plumbing & Heating. Matt, Fox’s Young Plumber in Training, has shown a lot of leadership over the past several months here at Fox. And he finally had a chance to prove his skills in the field. Near the end of last week Fox had a Spot Repair that needed to be done, and our head of water services, Jose, was not available. Matt asked our service manager, Chad L., if he could take the lead on this project. After just six short months of learning and training, Matt felt that he was ready to lead a project by himself, but Fox Plumbing & Heating has a very strict policy about what we allow our employees who are not certified Journeymen to do. In this case, Matt still has several years until he can be a certified plumber, and that means that he isn’t yet qualified to provide service on his own yet. However, Chad agreed to monitor Matt and let him go out to meet Village Properties manager in the U District. 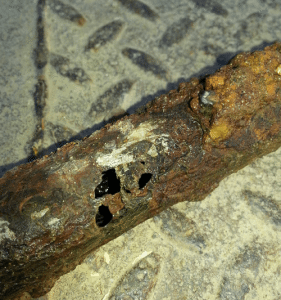 A spot repair is when a part of a pipe needs to be replaced, water or sewer line, because of an issue in the structural integrity of the pipe. In this case, it was a piece of the water line that was running from the condo in the U district. It was leaking and causing the condos water meter to continually run. 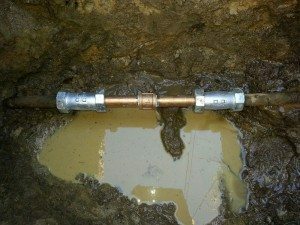 These types of issues can cost a lot in monthly water bills, and can lead to home and lawn damage if not addressed properly. This water line spot repair was even more time consuming because it was located below a concrete pathway that ran from the street to the condo. Chad oversaw as Matt took the manager through an explanation of what would need to be done, how long the process could take, and how long the condos would be without water. Because this was a condo, it would actually mean that Fox Plumbing & Heating would have shut off water to all the units. Matt began working at 10 am in the morning and completed the entire project and got everyone back with water within 4 hours. After he completed the project, he went through all of the units flushing their water lines, cleaning all the debris from the aerators and checking the faucets. 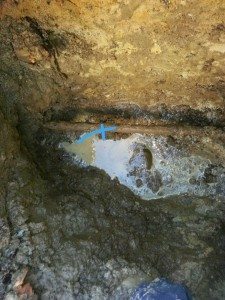 This spot repair began with shutting-off the water then locating the leak, which had been mapped out by our professional estimator, Rick M. Once the prep had been done, he had to jack hammer the concrete up, which was about a 3’x4’ of sidewalk, dug down about 3 feet, and cutout the 2 feet of galvanized pipe. At that point Chad and Matt confirmed that there was a dime sized hole in the pipe. Matt then cleaned the pipe where he had removed the galvanized piece, and cut a 2 foot piece of pipe to replace the old pipe. Then he added the new pipe with compression fittings to ensure that the new pipe wouldn’t leak. Chad double checked this and then they turned the water back on to the condos and checked the meter to ensure that there were no leaks. Then he went and checked all the condos and cleaned out any debris from the faucets. He then returned to the replaced pipe to ensure that there were no leaks. All of this was done exactly as he had been trained by Fox Plumbing & Heating’s water line expert, Jose. 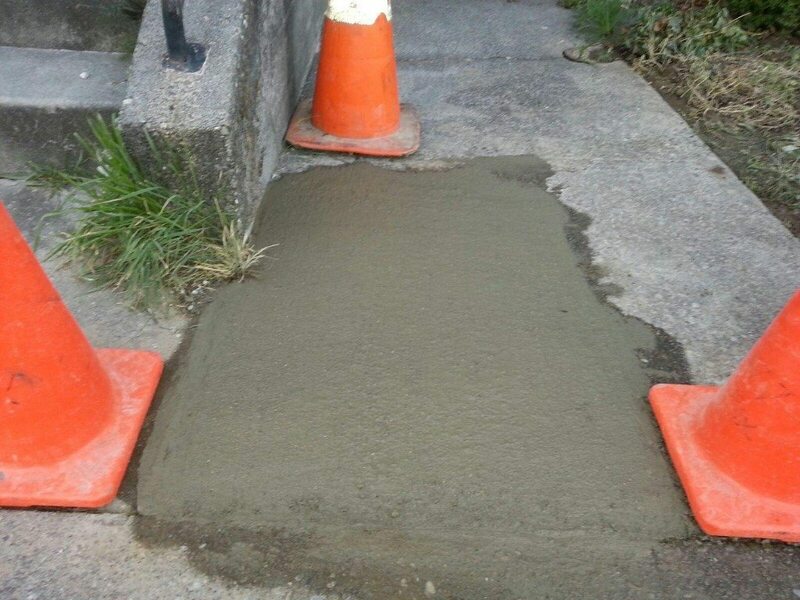 Once Chad had inspected Matt’s work, Matt poured concrete and, once it had dried, he brushed the concrete to make sure that you could never tell that he’d even worked on the water line. This is just one of the many parts of training to ensure that we leave the area better than when we began. 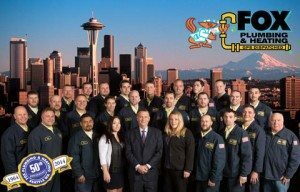 We pride ourselves on providing service the way a service company should. At the end of the job Chad allowed our young plumber in training to even get the digital signature to conclude the job. Remember: When You're Ready for the Best... Talk to Fox!